When it comes to heights, I’m a bit of an acrophobe. When I went to the Blarney Castle – determined to kiss the famed stone that endows the kisser with the gift of gab – it took a strange Irish man, my husband-to-be, and my future father-in-law ten minutes to coax me to smooch the stone. Unlike me, this photogenic feline (or mačka in Croatian) is indeed no scaredy cat! 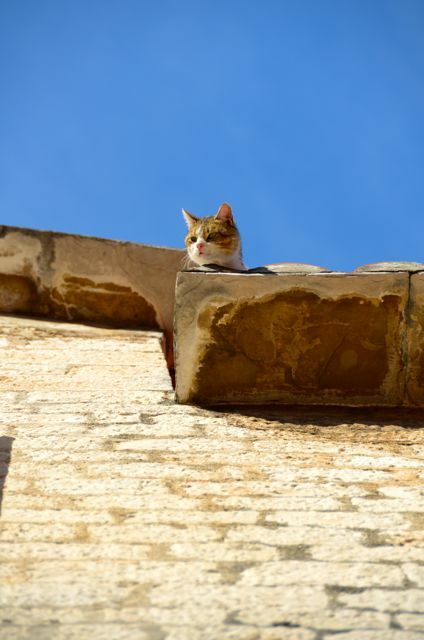 For a few minutes, I watched from down below, trying to coax her away from the roof of a stone building she was sunning on. Fortunately, she didn’t jump to the shutter, which was precariously blowing in the breeze. That’s what Mark says (below), Madhu, but it surely would’ve been a long drop. Certainly, it was a lovely day for sunbathing! Great cat photos. Wonder what he sees in that last photo…almost ready to pounce a la air. Lynne, I think kitty was assessing whether or not he could jump to the neighboring shutter, but perhaps spotted a plump critter running by? The locals must have found me a bit odd for spying on this rooftop action for so long. Look at the kitty! Oh that’s wild! Excellent! Quite a daredevil, wasn’t she? Now, if only I can muster up the courage to ascend the local bell tower, which is reputed to be quite frightening! OMG, please don’t fall or jump! It’s ok they always land on their feet. Mark, my family never had cats growing up, so I wasn’t sure what to expect. A ‘jumping sheet’ (as firemen previously used) would’ve come in handy. Maria, having grown up with dogs, I wasn’t that familiar with cat behavior, so this had me quite nervous! In Germany, I lived in a 4th floor (5th floor American) apartment and I’d sometimes see other neighborhood felines on rooftop perches. What a gymnast your cat is! Glad she landed unscathed. Thanks for stopping by, and hope you have a lovely weekend in Spain :) I’m happy to report that kitty descended safely (not without raising my blood pressure for a while though). I would’ve found myself staying there all day, ready to catch her if she did ever jump (or fall – not that any cat is any kind of clumsy). Beautiful shots, Tricia, as always. Thanks, Sid – I must confess that I stood there ’til she walked away from the edge too. 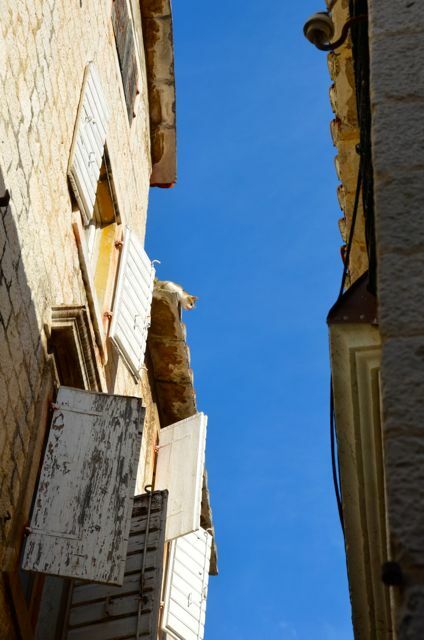 The locals gave me curious looks – I suppose it’s a common sight to see the cats acting like tightrope artists on these old roofs?